Looking for ways to motivate yourself to exercise? Looking for ways to increase your physical activity? Looking for other people to walk with? Then maybe YOU would be interested in the S.T.E.P.S. Walking Challenge! The S.T.E.P.S. Challenge is taking place across Monroe County from April 1st through June 8th (10 weeks)! Use an activity tracker (FitBit, Apple Watch, Pedometer, or other- must track # of steps). 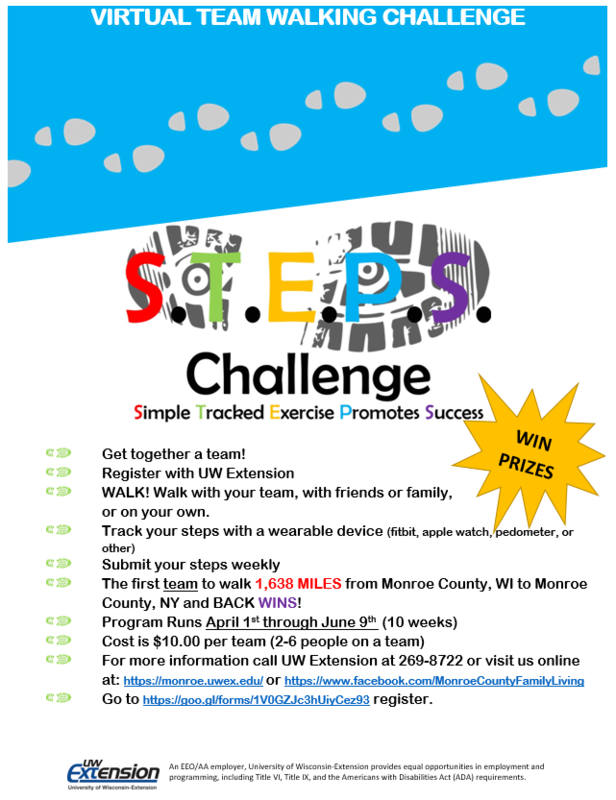 Teams will attempt to walk 1,638 MILES from Monroe County, WI to Monroe County, NY in 10 weeks! First team to make the distance WINS! All teams that complete the walk within the 10 weeks will be rewarded! Individual who walks the most steps will be rewarded!